I hope I can achieve a personal best, hopefully a time close to 15:40 for 5,000m for this SEA Games. Currently I have to juggle between studies and training but once after finals is over soon, I will be focusing on training fully so that I can achieve my target of 15:40 for 5,000m for SEA Games. One of the biggest challenges was during army where I could not train as I used to due to the commitments and trainings I had in army. I had to be really patient till ORD and when I started training after ORD, it took some time for me to reach my previous form I had in JC and to be motivated to train professionally once again. I decided to specialise for 5000m because I find training for middle distance too intense although I do enjoy running 800m and 1500m sometimes. Also, I find 10,000m, half-marathon and marathon too long and daunting and thus, I chose 5000m to be my pet event. My current coach is Mr Steven Quek who trains us, the NUS Cross Country Team. He is a fatherly figure who plans training for us, ensures we take care of ourselves by having enough rest and proper nutrition and help us to achieve our goals for running. 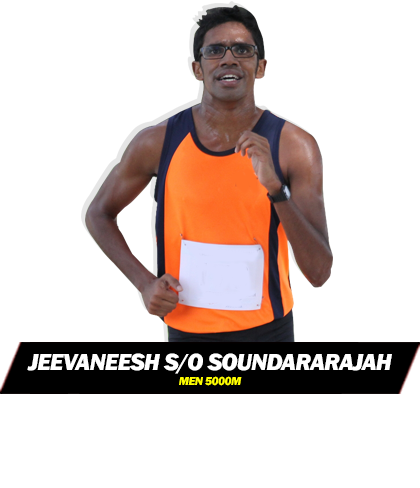 My previous coach is Mr Rameshon who coached me at Hwa Chong Institution and he is very dedicated to athletics and he is the one who convinced me to run competitively. I ensure I eat proper meals in the day, fruits for nutrition and I avoid fast food and fizzy drinks. Aside from athletics, I enjoy watching soccer as I support Arsenal. I wish I could play too but I can’t play much because I am worried that I might get injured. I train 3 times a week and it is planned in such a way that it does not affect my studies much during my school term so I got more time to study. Holidays is where I have the time to train more as well as spending time with my family and friends as well as have good rest. I train 3 times a week and it consist of 2 interval trainings and a long run at Macritchie Reservoir. My long term athletics goal is to continue improving my personal best for 5000m and break the 5000m national record in the near future.